Enjoy exclusive benefits when you book directly with Karma Kandara. Stay for 3 nights and receive one of these benefits for 2 people, a 60 minute Karma Massage, a complimentary return airport transfer or a 2 course lunch in di Mare Restaurant. 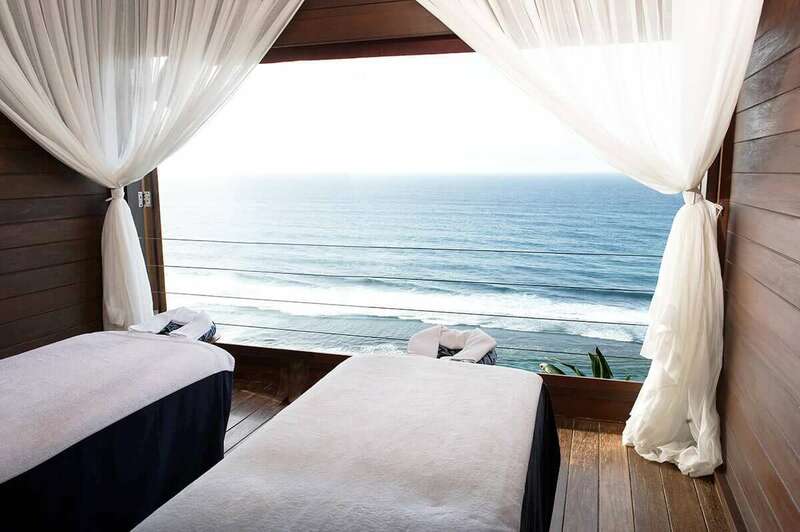 Our dramatic location in Uluwatu wasn’t chosen simply for its views. An expert in Feng Shui, the ancient understanding of energy – or Chi – in nature, highlighted this cliff-top hideaway for its powers of healing and good fortune. Whether you put it down to Chi or the quintessential Karma vibe, you can feel the positivity here. Architect-designed villas, each with a private pool, are positioned on the cliff above one of the top five beaches in Asia. Step outside the resort to discover authentic Balinese culture and festivals. The sacred Uluwatu Temple is just 20 minutes away. A championship 18-hole golf course is even closer. Explore the island and restore your soul at Karma Kandara. Karma Kandara is a 40-minute drive from Ngurah Rai airport. Slip off your shoes and let us customise a holiday like no other, just for you. From a restorative massage with an ocean view to the adrenaline rush of a private speedboat ride, our experiences are what set Karma apart. Winner of the Luxury Spa Awards 2015, Karma Spa Kandara offers soulful health, beauty and wellbeing. Head to our open-air platform where soft breezes caress your skin as you indulge in a cleansing ritual in our Infrared Detox Sauna and Himalayan Crystal Salt Pool. With Traditional Chinese Medicine, massage and wellness therapies, this is a true sanctuary for mind and body. 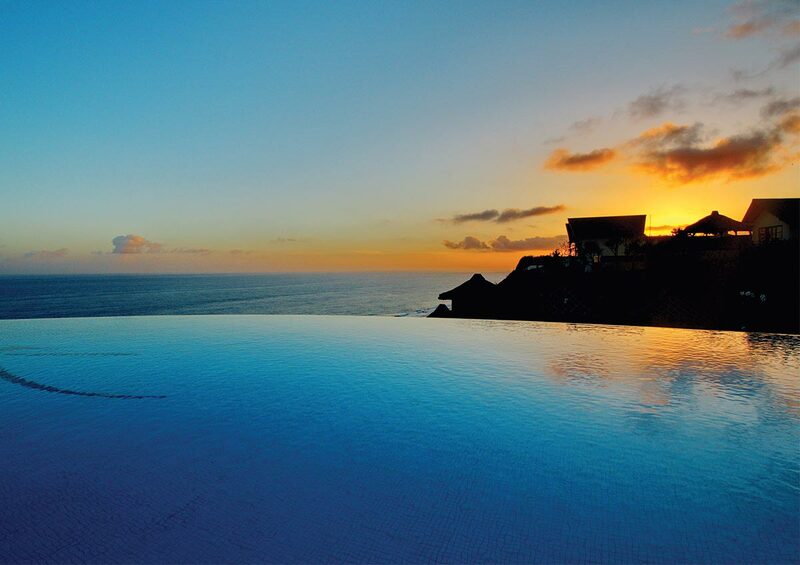 For the ultimate in high living, experience Karma Kandara’s Cliff Pool Club, where life is a cocktail of privileges. Enjoy a seductive mix of balmy breezes, majestic ocean and jungle vistas and singular cliff-edge dips in the seamless horizon of our infinity pool, fueled by languorous tipples, haute nibbles and cool pool-party tunes from noon till night. At happy hour, drink in kaleidoscopic sunsets over tropical libations serenaded weekdays by our resident spin masters and weekends by an elite lineup of international DJs. 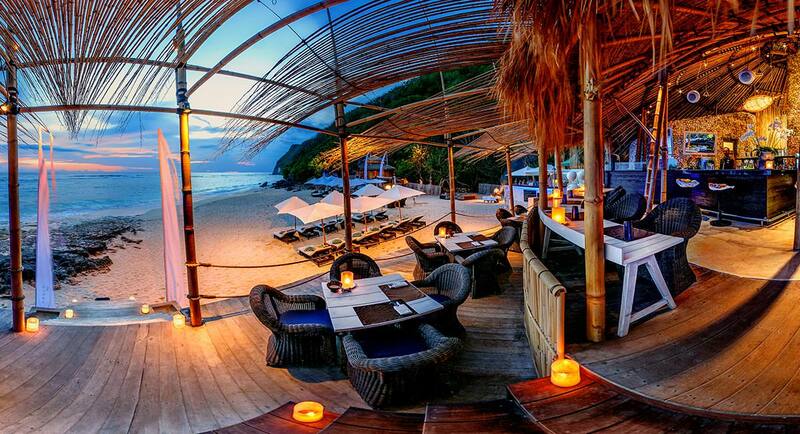 By night, groove under the stars and experience the singular vibe of Bali’s most over-the-top hot spot. The VERITAS cellar is stocked with fine Old and New World wines. Discover vintages from boutique growers and renowned labels with our tasting experiences. Let our sommeliers suggest a glass or two to suit your mood and tastes. Or simply sit back and choose a cigar from our humidor to enjoy with your Pinot Noir. Sultry and seductive, our rooftop Temple Bar & Lounge is inspired by the intoxicating atmosphere of Morocco. Whitewashed walls, colourful banquettes and giant stained-glass lanterns are the stunning backdrop to hedonistic nights of live music, custom cocktails and sharing plates with Middle Eastern flavours. Workout in our treehouse-style, teakwood gym, overlooking a jungle of tropical greenery. If you need even more inspiration to visit the gym, our staff can create a bespoke fitness programme for you to follow during your stay. Feel the feng shui energy in every experience at Karma Kandara. From an early-morning visit to a traditional fish market to the relaxation of yoga on the beach at sunset; learning to prepare a Balinese feast with our chefs to dancing beneath the stars to the sounds of an international guest DJ, live every moment for an unforgettable stay. The beach club redefined for a new generation of travellers. This is a toes-in-the-sand, head-in-the-stars, beat-in-the-heart destination offering music, relaxation, spa treatments, watersports and the unique, hedonistic Karma vibe. Enjoy by day; indulge by night; remember forever. 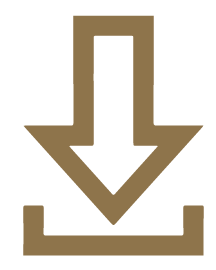 Acting as a virtual assistant before your visit or an on-hand fixer during your stay, our concierge service will help you plan your ideal itinerary. Our friendly, in-the-know team will book restaurant reservations, tickets to performances, helicopter flights and more, for a guest experience tailored to you. Every member of the family is cared for at Karma Kandara. 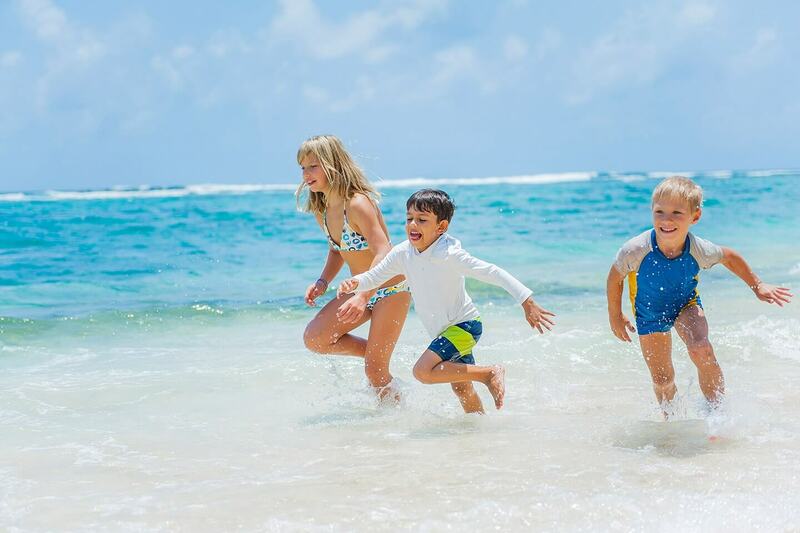 Our Three Monkeys Kids Club creates adventures and activities for kids aged 4 to 12 years, including beachcombing, kite making, crafts and swimming. Teens and parents won’t miss out on the fun as we offer a chance to explore Bali with a range of exciting guided excursions. 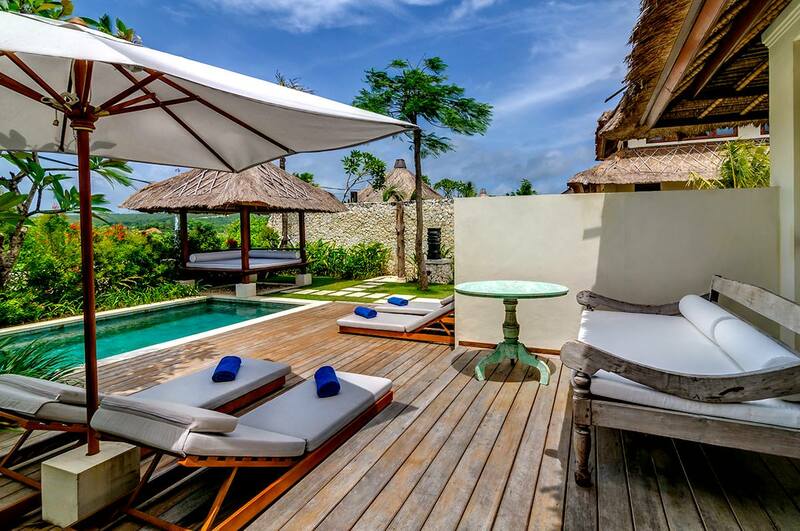 Karma Kandara blends traditional Balinese architecture with luxury amenities to create a series of private villas, each formed from pavilions arranged around their own tropical courtyard and private pool. The two, three and four-bedroom villas feature natural stone, teakwood decks and indigenous grass or ironwood tile roofs. Sliding doors open on to large balconies with garden, island and ocean views. 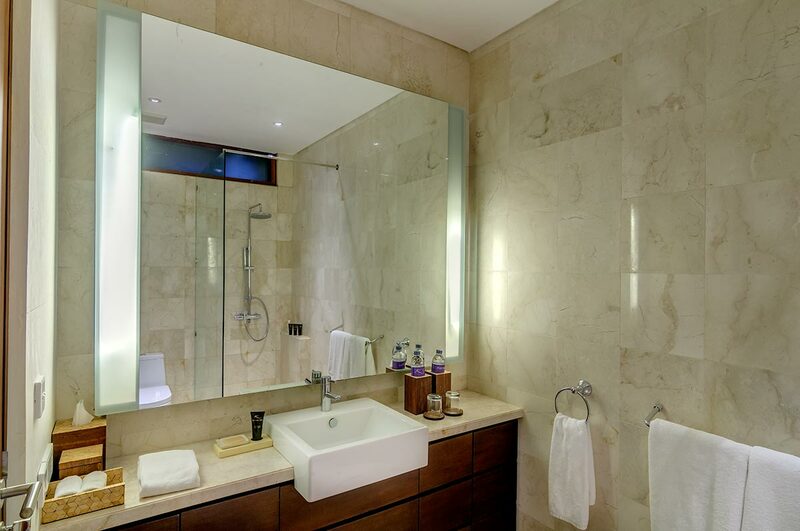 Interiors are airy and contemporary, with semi-alfresco bathrooms, luxurious fixtures, antiques and local artworks. Select from Karma Kandara Grand Cliff Front residences in one of the world’s most privileged locations, with sweeping views of ocean and sky. 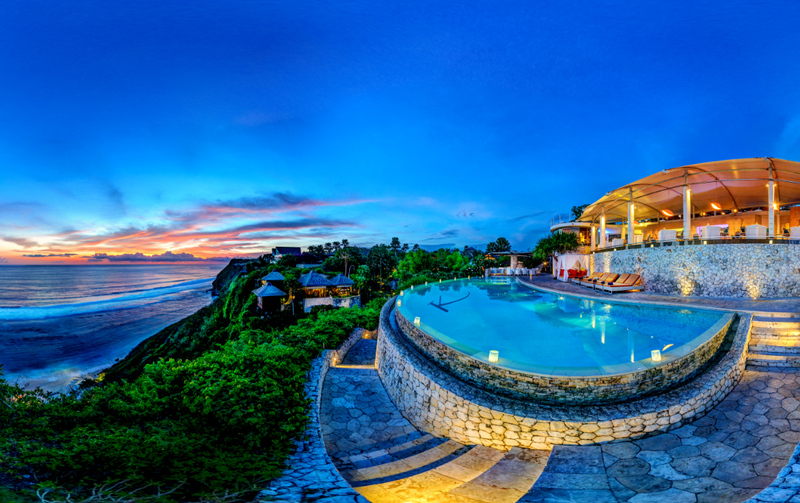 Or choose a stunning surf-kissed villa at Karma Beach Bali. With exclusive private garden, pool, relaxation pavilions, fully appointed SMEG kitchen and stunning living spaces. Indulge your loved ones in a prestigious 2-bedroom villa, with pool, lush private garden, SMEG kitchen and luxurious living spaces. Three spacious bedrooms, plus serene relaxation pavilions, sumptuous living spaces, private tropical garden, pool and fully appointed SMEG kitchen. An elegant four bedroom residential experience in this spacious villa with lush garden views. 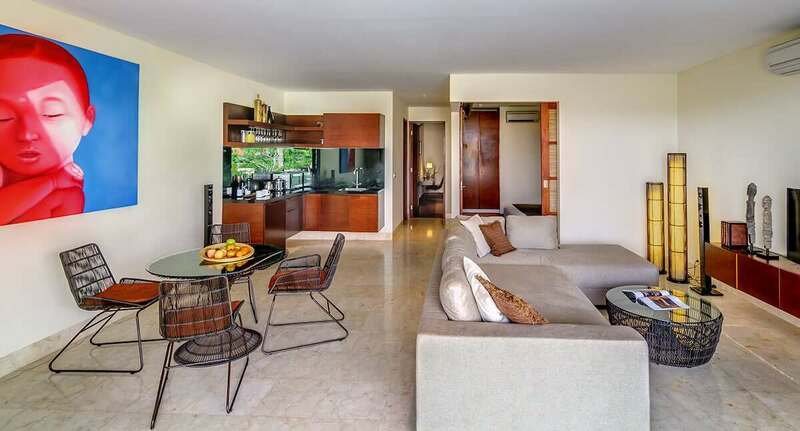 Serene relaxation pavilions, sumptuous living spaces, private tropical garden, pool and fully appointed SMEG kitchen. The Karma Kandara luxurious accommodation benchmark is set with our two most extraordinary properties, which are set on a cliff top overlooking Bali’s most beautiful beaches: Karma Villa Maria and Villa Grand Residence Nirvana. Villa Grand Residence Nirvana is a 922 square metre five-bedroom property with a luxurious lounge area, fully equipped kitchen, cinema room, swimming pool, cliff-side deck and private patio. Karma Villa Maria is a 1,200 square metre property with five bedrooms, a spa area with sauna and steam room, two swimming pools, three jet pools, a private cinema room and gym. Romance, luxury and attention to detail… At Karma Kandara we invest our energy in creating the most magical day of your life. Our talented wedding coordinators create personalised scenarios with a range of stunning settings, including cliff-top, beachfront, poolside and sunset ceremonies. The cuisine at Karma Kandara Resort is quite simple really: fresh ingredients, exotic flavours and classic cooking techniques inspired by our favourite European and Asian destinations. 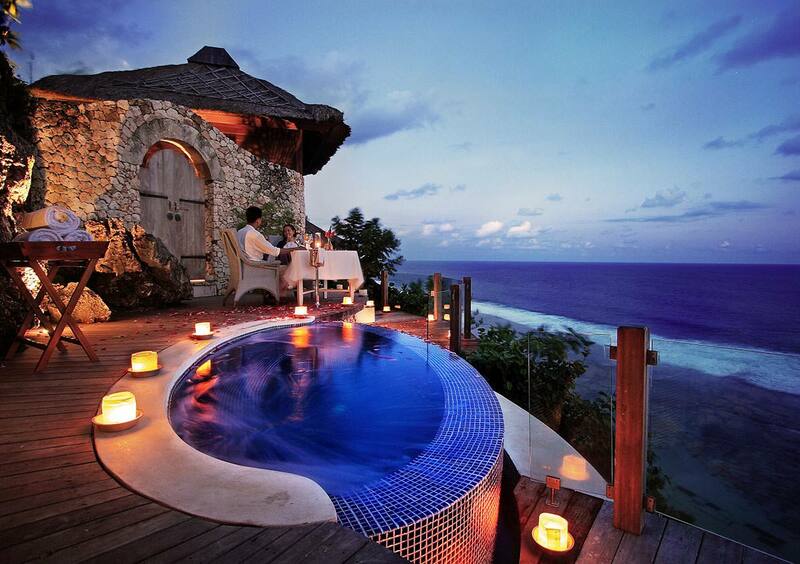 Award-winning Mediterranean cuisine served in a stunning cliff-top setting overlooking the Indian Ocean. The seasonal fine-dining menu focuses on super-fresh ingredients, exotic flavours and classic cooking techniques, complemented by a superb list of international wines. Clean eats made from 100% local, organic and pesticide-free ingredients. Our imaginative spa menu includes raw-food pizzas, grilled salmon with quinoa and seasonal salads, plus healthful drinks and tonics such as anti-inflammatory Turmeric Tonic and green juices. 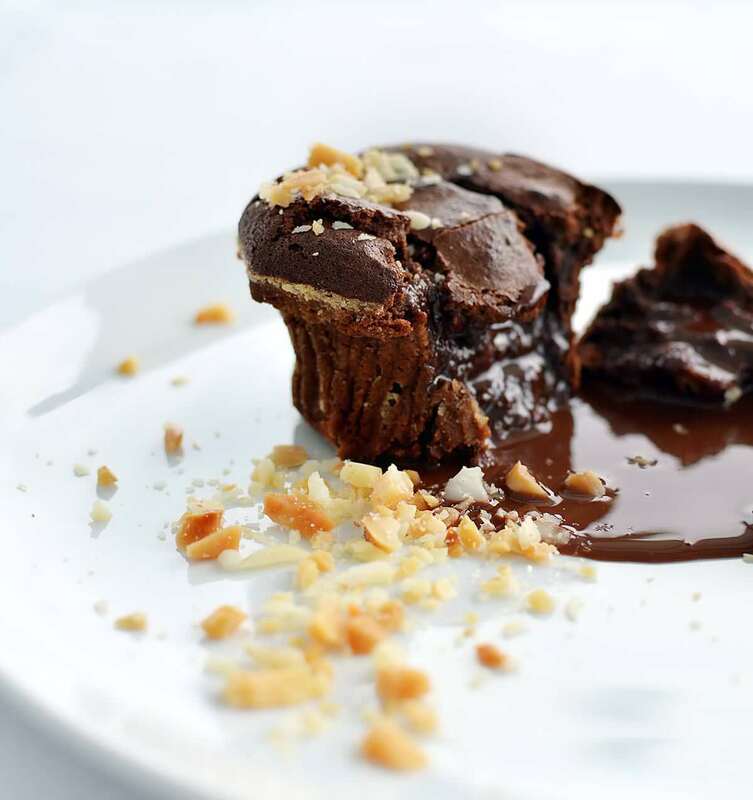 Low-sugar, dairy-free, gluten-free, wheat-free and vegan options available. 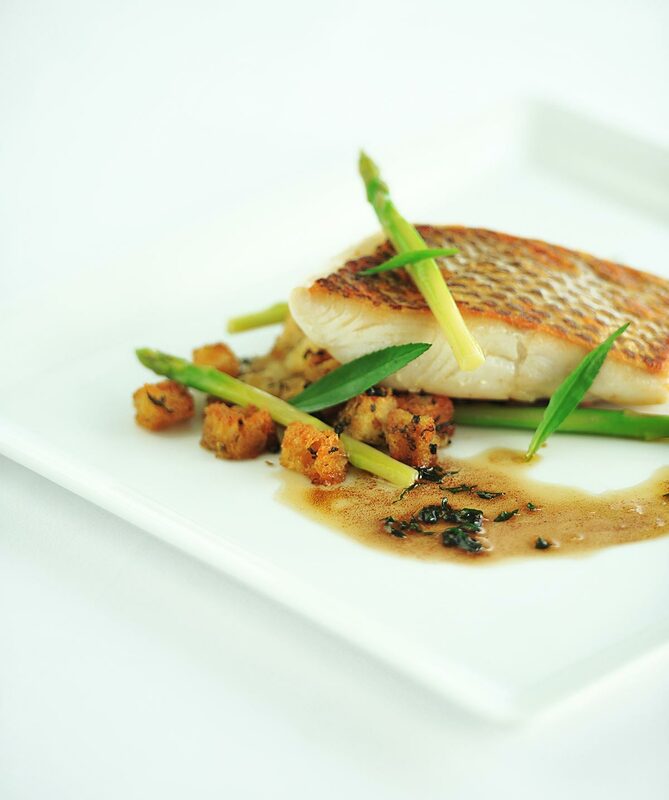 If you have specific dietary needs, book a consultation with our Spa Manager and Executive Chef who will create a bespoke menu for you. Set on the rooftop of di Mare, Temple Lounge evokes a North African ambience, colorful banquettes & lanterns, create a Kasbah like, setting where guests enjoy custom cocktails and middle east inspired tapas. Enjoy exclusive benefits with Karma membership. Experience life with a new rhythm at our bespoke beach club events. Explore exclusive offers, deals and discounts for Karma Kandara and our other award-winning luxury resorts worldwide. Ramadan is a time when families, friends and loved ones gather together to share special moments and create precious memories. Karma Resorts brings delightful dining and getaway promotions to celebrate the spirit of Ramadan. For the month of April we are offering you an amazing 35% off our spa treatments. Karma Spa is the soul of our resort – a sanctuary where you can slow down, breathe, and be at ease. Pay for three nights at our award winning luxury resort Karma Kandara in Uluwatu and you will receive US$450 resort credit to spend on any element of your holiday including; Accommodation, Food and Beverages, Spa Treatments and Airport Transfers. Looking for that hot deal to make your Bali holiday a reality, we are offering you the opportunity to book our award winning luxury resort Karma Kandara in Uluwatu with 35% off our Best Available Rates. Celebrate love, your anniversary, self-love and gratitude with this ritual inspired by traditional Balinese ceremonies. 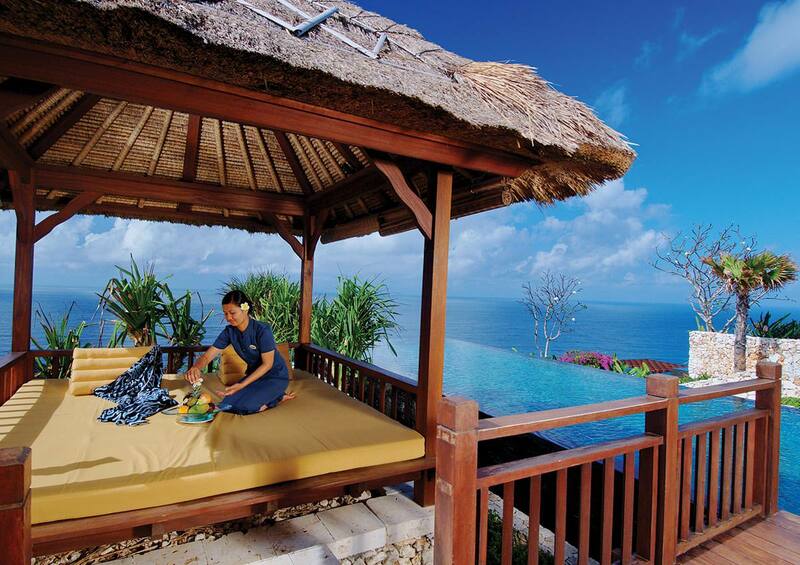 It begins with a 90-minute Sacred Balinese Massage to soothe and nurture. Spend the day in your private poolside gazebo including a bottle of champagne, a bottle of vodka and free flow al a carte from the poolside menu. Karma’s Yoga Ambassador, Ola Lirka, in-residence April 16-28th. Immerse yourself in wellness at Karma Kandara with contemporary Yoga led by our yoga ambassador Ola Lirka combined with bespoke treatments at our Karma Spa. 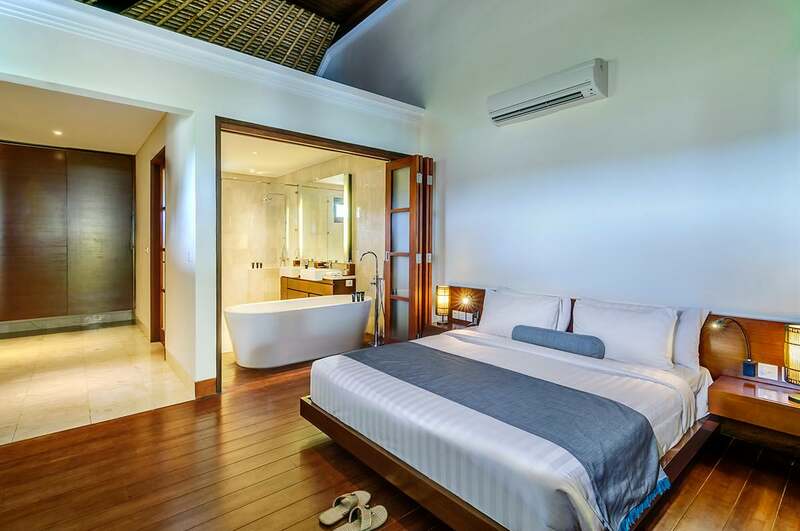 Enjoy Karma Kandara’s beachside luxury whilst being just a short drive to New Kuta Golf for the perfect golfing break. Our Easter Extravaganza offers you the luxury of space and unique VIP inclusions to ensure a very special Easter holiday filled with fun, sun and endless beach days. Sunday is traditionally a day of rest, and at Karma we have created a Sunday Wellness program to recharge you for the week ahead. Enjoy morning yoga, wellness tonics and lazy yogi Sunday Thai-fusion massages. Immerse yourself in Karma Kandara’s Easter Extravaganza, a fun-filled journey for the entire family. Share in the traditions, indulge in the cuisine, release your inner child and let Karma bring your Easter Holidays dreams to life in our tropical playground. Yoga is an ideal way to build strength, focus, flexibility and stamina. Enrich your yoga practice with our Holistic Yoga program for 2, 3, 5, or 7 nights. Detoxify, cleanse and renew with our Holistic Detox program. Enjoy luxury rejuvenation in Bali through a holistic program that incorporates healthy gourmet fare and wellness at a multi-award-winning five-star clifftop resort and spa overlooking the Indian Ocean.